Teochew preserves many Old Chinese pronunciations and vocabulary that have been lost in some of the other modern varieties of Chinese. As such, many linguists[who?] consider Teochew one of the most conservative Chinese dialects. Teochew is a variety of Southern Min, which in turn constitutes a part of Min Chinese, one of the seven major language groups of Chinese. As with other varieties of Chinese, it is not mutually intelligible with Mandarin, Cantonese, Shanghainese and other Chinese varieties. However, it has limited intelligibility with the Hokkien dialects, such as those of Amoy, Quanzhou, Zhangzhou and Taiwanese. Even within the Teochew dialects, there is substantial variation in phonology between different regions of Chaoshan and between different Teochew communities overseas. The Chaoshan region, which includes the twin cities of Chaozhou and Shantou, is where the standard variant of Teochew (Chaoshan dialact) is spoken. Parts of the Hakka-speaking regions of Jiexi County, Dabu County and Fengshun, also contain pocket communities of Teochew speakers. As Chaoshan was one of the major sources of Chinese emigration to Southeast Asia during the 18th to 20th centuries, a considerable Overseas Chinese community in that region is Teochew-speaking. In particular, the Teochew people settled in significant numbers in Cambodia, Thailand and Laos, where they form the largest Chinese sub-language group. You will also find many Teochew-speakers among Chinese communities in Vietnam, Singapore, Malaysia (especially in the states of Johor and Selangor) and Indonesia (especially in West Kalimantan on Borneo). Waves of migration from Chaoshan to Hong Kong, especially after the communist victory of the Chinese Civil War in 1949, has also resulted in the formation of a community there, although most descendants now primarily speak Cantonese and English. Teochew speakers are also found among overseas Chinese communities in Japan and the Western world (notably in the United States, Canada, Australia, United Kingdom, France and Italy), a result of both direct emigration from Chaoshan to these nations and secondary emigration from Southeast Asia. In Singapore, Teochew remains the ancestral language of many Chinese Singaporeans, with the Teochews making up second largest Chinese group in Singapore, after the Hokkiens. Despite this many Teochew, particularly the younger generations are shifting towards English and Mandarin as their main spoken language. This is due to the Singapore government's stringent bilingual policy that promotes English as the official language of education, government and commerce and promotes Mandarin at the expense of other Chinese varieties. Some Teochews assimilated with the larger Hokkien community and speak Hokkien rather than Teochew due to Hokkien's prominent role as a lingua franca previously among the Singaporean Chinese community and the similarities between the two varieties. Teochew is indigenous language and was predominant in Bangkok, until after World War II, government force assimilation the Teochews who be Thai citizen, cause them language shift into Central Thai quickly. Today Teochew status is endangered, and still spoken among older ethnic Chinese Thai citizens, by the younger Thai Chinese is Central Thai native speaker. Teochew was never widely spoken among Chinese communities in Japan and South Korea, since most of the Teochew people who migrated to these countries are secondary immigrants from Hong Kong and Taiwan. Most of them are second-generation people from Hong Kong and Taiwan who speak Cantonese, Hokkien and Mandarin, as well as Korean and Japanese, leaving Teochew to be spoken mostly by elders. Teochew is a variety of Southern Min and is one of the more well known Min Chinese varieties, together with Hokkien, which is spoken in southern Fujian, and the Fuzhou dialect, a dialect of Eastern Min, spoken in Fujian's capital, Fuzhou. Due to historical influence, it shares many phonetic similarities to Hokkien but has low lexical similarity. Although Teochew shares some cognates with Hokkien, there are pronounced differences in most vowels with some consonant and tone shifts. Many of its vocabulary and phrases are distinct from Hokkien. For example while Hokkien use the word beh (欲) to mean 'want' in Teochew the word ai (爱) which means 'love' in Teochew is also used to mean 'want' in Teochew. Hokkien uses the word ia (野) to mean 'very' while Teochews use the word kue (過) which also means 'to cross or to pass' in their language to mean 'very'. Other than the -p final found in both dialects, Hokkien retains the different finals of -n, -ng, -t and -k while Teochew only has -ng and -k finals as a result of final merging. This caused many Teochews to be unable to properly pronounce the final -n in english words and in replacement they often pronounce it as -ng instead. Teochew has only 51% intelligibility with the Hokkien variant of Tong'an Xiamen dialect (Cheng 1997) almost the same as the percentage of intelligibity between Russian and Ukrainian languages, while it has an even lower mutual intelligibilty language with other dialect variants of the Hokkien language. Both Hokkien and Teochew have different accents too. Most Teochew do not speak Hokkien and the majority of Hokkiens and Teochews both see themselves as a distinct groups, but due to certain similarities most can understand certain dialects[clarification needed] of Hokkien to a limited degree and may treat it as a variation of their own tongue. 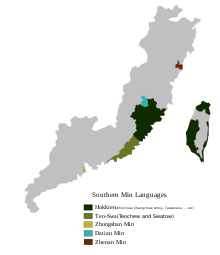 There are a minority of Teochew who speak Hokkien as their mother tongue, most of whom have close contact or relatives in the neighbouring three originally Teochew counties now part of South Fujian seceded to the Hokkien cultural region during the early Tang dynasty and subsequently assimilated into the Hokkien population. These Hokkien speaking Teochew people are more likely to treat Teochew simply as accented form of Hokkien. These people usually have a strong sense of Hokkien identity and due to cultural similarities, easily integrate into Hokkien culture. This refers to Chaozhou, the variant of Southern Min (Min Nan) spoken in China. Chaozhou children are introduced to Standard Chinese as early as in kindergarten; however, Chaozhou remains the primary medium of instruction. In the early years of primary education, Mandarin becomes the sole language of instruction, although students typically continue to talk to one another in Chaozhou. Mandarin is widely understood, however minimally, by most younger Chaozhou speakers, but the elderly usually do not speak Mandarin since teaching was done in the local vernacular in the past. Since Chao'an, Raoping and Jieyang border the Hakka-speaking region in the north, some people in these regions speak Hakka, though they can usually speak Chaozhou as well. Chaozhou people have historically had a great deal of contact with the Hakka people, but Hakka has had little, if any, influence on Chaozhou. Similarly, in Dabu and Fengshun, where the Chaozhou- and Hakka-speaking regions meet, Chaozhou is also spoken although Hakka remains the primary form of Chinese spoken there. Because of the strong influence of Hong Kong soap operas, Guangdong provincial television programs and Cantonese pop songs, many young Chaoshan peoples can understand quite a lot of Cantonese even if they cannot speak it in certain degrees of fluency. In the mountainous area of Fenghuang (凤凰山; 鳳凰山), the She language, an endangered Hmong–Mien language, is spoken by the She people, who are an officially recognised non-Han ethnic minority. They predominantly speak Hakka and Teochew; only about 1,000 She still speak their eponymous language. Teochew, like other Southern Min varieties, is one of the few modern Sinitic languages which have voiced obstruents (stops, fricatives and affricates); however, unlike Wu and Xiang Chinese, the Teochew voiced stops and fricatives did not evolve from Middle Chinese voiced obstruents, but from nasals. The voiced stops [b] and [ɡ] and also [l] are voicelessly prenasalised [ᵐ̥b], [ᵑ̊ɡ], [ⁿ̥ɺ], respectively. They are in complementary distribution with the tenuis stops [p t k], occurring before nasal vowels and nasal codas, whereas the tenuis stops occur before oral vowels and stop codas. The voiced affricate dz, initial in such words as 字 (dzi˩), 二 (dzi˧˥), 然 (dziaŋ˥), 若 (dziak˦) loses its affricate property with some younger speakers abroad, and is relaxed to [z]. Syllables in Teochew contain an onset consonant, a medial glide, a nucleus, usually in the form of a vowel, but can also be occupied by a syllabic consonant like [ŋ], and a final consonant. All the elements of the syllable except for the nucleus are optional, which means a vowel or a syllabic consonant alone can stand as a fully-fledged syllable. All the consonants except for the glottal stop ʔ shown in the consonants chart above can act as the onset of a syllable; however, the onset position is not obligatorily occupied. Teochew finals consist maximally of a medial, nucleus and coda. The medial can be i or u, the nucleus can be a monophthong or diphthong, and the coda can be a nasal or a stop. A syllable must consist minimally of a vowel nucleus or syllabic nasal. Teochew, like other Chinese varieties, is a tonal language. It has six tones (reduced to two in stopped syllables) and extensive tone sandhi. As with sandhi in other Min Nan dialects, the checked tones interchange. The yang tones all become low. Sandhi is not accounted for in the description below. The grammar of Teochew is similar to other Min languages, as well as some southern varieties of Chinese, especially with Hakka, Yue and Wu. The sequence 'subject–verb–object' is typical, like Standard Mandarin, although the 'subject–object–verb' form is also possible using particles. The personal pronouns in Teochew, like in other Chinese varieties, do not show case marking, therefore 我 [ua] means both I and me and 伊人 [iŋ] means they and them. The southern Min dialects, like some northern dialects, have a distinction between an inclusive and exclusive we, meaning that when the addressee is being included, the inclusive pronoun 俺 [naŋ] would be used, otherwise 阮 [ŋ]. No other southern Chinese variety has this distinction. liŋ5 零 〇 0 〇 is an informal way to represent zero, but 零 is more commonly used, especially in schools. also 么(T) or 幺(S) [iou1] when used in phone numbers etc. or as an ordinal number e.g. 第二 [tõĩ6 dzi6]. tsap8 拾 十 10 Although some people use 什, It is not acceptable because it can be written over into 伍. Note: (T): Traditional characters; (S): Simplified characters. Ordinal numbers are formed by adding 第 [tõĩ˧˥] in front of a cardinal number. S/he was killed (by someone). Even though this 人 [naŋ˥] is unknown. The same holds true for Mandarin and Cantonese in that another structure needs to be used when only one of the nouns being compared is mentioned. Note also that Teochew and Mandarin both use a pre-modifier (before the adjective) while Cantonese uses a post-modifier (after the adjective). This skirt is not as good as that one. My computer (at home) is far better than his. Note the use of the adverbial 好多 [hoʔ2 tsoi7] at the end of the sentence to express a higher degree. This book is as heavy as that one. Lit. The two people are the same same way. To express the superlative, Teochew uses the adverb 上 [siaŋ5] or 上頂 [siaŋ5 teŋ2]. 上頂 is usually used with a complimentary connotation. This (restaurant) is (absolutely) the most delicious. Lit. The people treat me very well. The vocabulary of Teochew shares a lot of similarities with Cantonese because of their continuous contact with each other. [ambiguous] Like Cantonese, Teochew has a great deal of monosyllabic words. However, ever since the standardisation of Modern Standard Chinese, Teochew has absorbed a lot of Putonghua vocabulary, which is predominantly polysyllabic. Also, Teochew varieties in Singapore, Malaysia and Indonesia have also borrowed extensively from Malay. Teochew and other Southern Min varieties, such as Hokkien, preserve a good deal of Old Chinese vocabulary, such as 目 [mak] eye (Chinese: 眼睛; pinyin: yǎnjīng, Hokkien: 目 ba̍k), 灱 [ta] dry (Chinese: 乾; pinyin: gān, Hokkien: 焦 ta), and 囥 [kʰəŋ] hide (cf. Chinese: 藏; pinyin: cáng; Hokkien: 囥 khǹg). Teochew was romanised by the Provincial Education Department of Guangdong in 1960 to aid linguistic studies and the publication of dictionaries, although Pe̍h-ōe-jī can also be used because Christian missionaries invented it for the transcription of varieties of Southern Min. Initial consonants of Teochew, are represented in the Guangdong Romanization system as: B, BH, C, D, G, GH, H, K, L, M, N, NG, P, R, S, T, and Z.
Vowels and vowel combinations in the Teochew dialect include: A, E, Ê, I, O, U, AI, AO, IA, IAO, IO, IU, OI, OU, UA, UAI, UE, and UI. Many words in Teochew are nasalized. This is represented by the letter "n" in the Guangdong Pengim system. Ending consonants in Teochew include M and NG as well as the stops discussed below. Teochew retains many consonant stops lost in Mandarin. These stops include a labial stop: "b"; velar stop: "g"; and glottal stop: "h". ^ Hammarström, Harald; Forkel, Robert; Haspelmath, Martin, eds. (2017). "Teochew". Glottolog 3.0. Jena, Germany: Max Planck Institute for the Science of Human History. ^ Hammarström, Harald; Forkel, Robert; Haspelmath, Martin, eds. (2017). "Chaozhou". Glottolog 3.0. Jena, Germany: Max Planck Institute for the Science of Human History. ^ Hammarström, Harald; Forkel, Robert; Haspelmath, Martin, eds. (2017). "Chaoshan". Glottolog 3.0. Jena, Germany: Max Planck Institute for the Science of Human History. Wikivoyage has a travel guide for Teochew phrasebook.